The A-2T HIGHPOLISH™ is constructed from a solid titanium case which undergoes a high speed polishing operation in order to achieve a brilliant bright metallic finish. This durable finish is achieved directly from the titanium and will hold up well to years of rigorous activity. 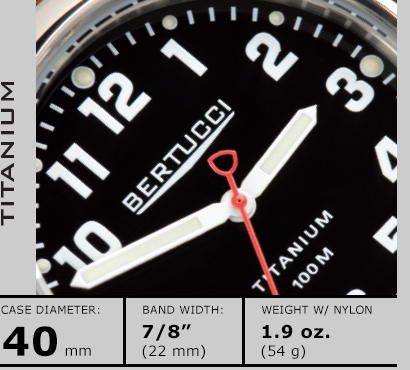 The highly polished case is complimented by a classic gloss finished dial that features easy to read numbers and hands. The hands and markers are treated with high performance Swiss Super Luminous material that will intensely glow for hours based on exposure to sunlight or indoor lighting... not requiring a button push (a weak point), and will not deplete battery or require two hand operation. B-TYPE Heavy-Duty DX3® Zulu Nylon Webbing Band offers long lasting durability and comfort unmatched in the marketplace. Featuring military spec. nylon webbing, heavy-duty stitching, and solid stainless steel buckle and dual loop keepers. The Active Comfort™ one piece design is equipped with the Fold and Tuck™ excess band retention feature and wide adjustment range to ensure a perfect fit for all wrist sizes. B-TYPE Montanaro™ Leather Band offers long lasting rugged refinement, active comfort, and ergonomics. It features high performance water resistant top grain leather from the finest tanneries in the USA, durable box and edge stitching, a fully lined construction, and a stainless steel roller buckle and keeper loop. The Montanaro Survival™ Leather band is simply unmatched in the marketplace as it offers light weight, durability, and comfort. Made in the USA. Made in the USA using high performance world famous Horween® leather of Chicago. The old world craftsmanship hand rubbed finish will patina and improve with age. The combination tanned, hot stuffed top grain leather offers superior comfort, beauty and long lasting durability.